In an epic takedown of a ruling issued Friday, a federal judge tossed a fraud lawsuit against Starbucks, dismissing claims that the coffee chain was defrauding customers by using a misleading amount of ice in their cold (i.e. iced) beverages. 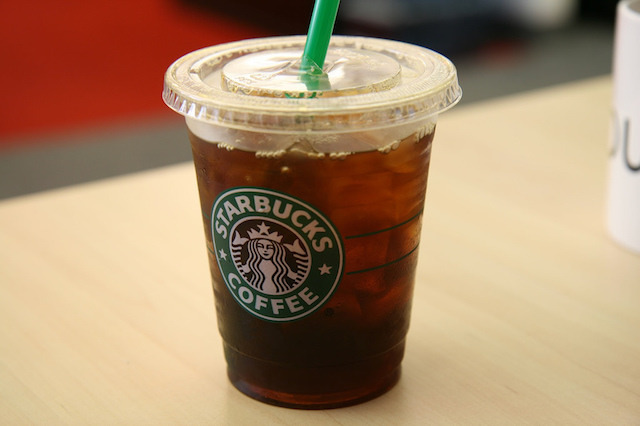 Los Angeles resident and Starbucks customer Alexander Forouzesh had filed a claim alleging that Starbucks was systematically defrauding customers by advertising cold drinks like iced coffee and tea as being a certain size, "underfilling" cups with liquid, and then using extra ice to pad the order and make the cup appear full. "I&apos;ve been drinking iced coffee for a really long time. You can get refills on regular coffee, they give it to you no problem, but with the iced coffee, they wont give you refills. I was very upset and I thought about it and I felt like I was being scammed," Forouzesh told LAist over the phone on Wednesday afternoon. Forouzesh is a native Angeleno and works in real estate. In the lawsuit, he argued that ice is not a beverage, at least going by the dictionary definition of "beverage" as a "drinkable liquid," thereby making the 16 ounces of drinkable liquid promised to any customer with a "Grande"-sized order a total lie. By the plaintiff&apos;s calculations and per his complaint, this large-scale ice fraud means that Starbucks "Grande"-sized cold beverages only contain 12 ounces of liquid instead of the 16 ounces listed on the Starbucks menu, and "Venti" sizes only contain approximately 14 ounces of liquid instead of the promised 24 ounces. I swear to God I&apos;m not making this up. The complaint took particular issue with the black horizontal lines on Starbucks&apos; cold drink cups, which the plaintiff alleged are actually used as pre-set fill lines, despite not being located at the top of the cup. Grubstreet confirms that the fact that baristas use the lines as a built-in measuring guide for pouring drinks is a "little-known secret." Basically, in Forouzesh&apos;s view, the systematic use of fill lines for liquid beverages [so that there is enough room in your cup for the ice in your ICED drink] proves systematic fraud. Never mind the fact that—as the judge made sure to remind us in his ruling—the cold drink cups are clear, so a consumer can still see determine the exact ice-to-liquid ratio of a drink literally just by looking at it. Mr. Forouzesh was nothing if not inclusive in his attempted class-action suit, aiming to represent "All persons in the state of California who purchased one or more the Defendant&apos;s Cold Drinks at any time between April 27, 2006 and the present." Starbucks brought a motion to dismiss soon after Forouzesh filed his case in May, with their primary argument being that—ice or no ice—their cold beverages still "meet the expectations of reasonable consumers." A reasonable consumer doesn&apos;t need a doctorate in physics to know that the presence of ice will somewhat alter the volume of liquid able to be put in a cup, and that an iced drink, by definition, probably contains some ice. Starbucks is a coffee chain, not a magic store, after all. ...When a reasonable consumer walks into a Starbucks and orders a Grande iced tea, that consumer knows the size of the cup that drink will be served in and that a portion of the drink will consist of ice. Because no reasonable consumer could be confused by this, Plaintiff fails to state viable CLRA, UCL, or FAL claims. In news that will be depressing to those who still have faith in humanity but more just hey, it&apos;s Wednesday to everyone else, Forouzesh wasn&apos;t even the first person to sue Starbucks for ice fraud. A very similar case is currently pending in Chicago federal court. Another totally separate lawsuit, this time targeting Starbucks&apos; alleged underfilling of hot drinks, is also making its way through the legal system, as Eater reported in June. What a time to be alive! "I don&apos;t think justice has been served," Forouzesh told LAist. "I think I&apos;m gonna push my attorney to file an appeal." And finally, the real pressing question: is Forouzesh still frequenting Starbucks, ice theft and all? He said yes, for now. "I don&apos;t really have a choice, because I love iced coffee," he said. "But if I lose this case I&apos;ll probably switch over to Coffee Bean."